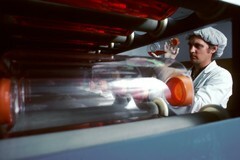 A Caucasian male technician wearing a white lab coat and head covering, rubber gloves, is holding a large glass roller bottle and looking into it. A red liquid is visible in the tilted roller bottle. This process is the growing of monoclonal antibodies. They can be grown in unlimited quantities in bottles in the lab. Several shots available.